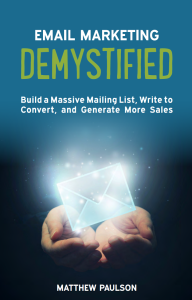 My new book, Email Marketing Demystified, is now available on Amazon. The e-book edition of the book will be available for free through Amazon from September 30th, 2015 to October 4th, 2015. Paperback and audiobook editions are also available. After I published my first book, 40 Rules for Internet Business Success, last year, I didn’t have much of an appetite to write another book. Getting a book out is a long, grueling and expensive process. Many have compared writing a book to being pregnant. There’s nine months of pain and hard work before you see any results. After your book comes out (or the baby comes), you have no desire to repeat the process. After the months pass, you forget the difficulty of writing (or baby making) and are ready to repeat the process again. This June, I got the ambition to start writing again. 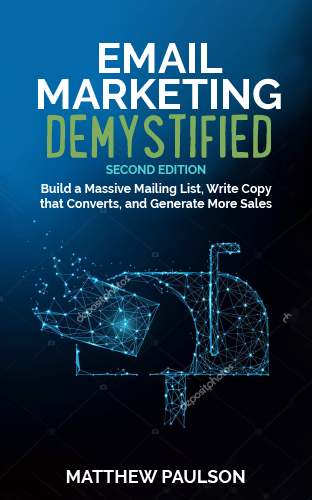 I put together an outline about email marketing in late June and started putting a book together in July. After an 18 day sprint of writing more than 3,000 words each day, I had the first draft of the book complete. A few months have passed since then. The book was cleaned up by the team of professional editors at Craft Your Content. Ellen Jesperson put together a fantastic cover. James Woosley did a great job doing the layout for the print and Kindle editions of the book. Stu Gray and Toby Lyles worked together to create the audiobook edition of the book. And, Tom Morkes worked tirelessly with me to help get me onto podcasts and help promote the book. Every aspect of the book is finished and now we’re ready to share it with the world. If you’d like to grab a copy, head on over to Amazon today and get your free Kindle copy or order a paperback if that’s more your style. If you find the book helpful, please leave a review of the book on Amazon so that I can do a better job of writing my next book and so that other people know what the early readers of the book think about it.